During journeys into the heart of the Amazon, spiritual healer Foster Perry experienced the strange, otherworldly perceptions of shamanic cultures by participating in their sacred ayahuasca rituals. These visions brought up every charged issue separating him from the "natural harmony between the spirit and the conditions of life." To heal himself, the author had to confront his wounded male with its seductive behavior, which he processed in group seminars throughout South America. In redeeming himself, Perry shows us what drives "wounded healers" to abuse their spiritual authority. "A fascinating tour of the sacred journeys and ecstatic--yet poignant--life of a modern shaman. Filled with forest wisdom and the spiritual genius of native peoples, it gives the reader a true taste of the once-and-future mysteries that prime the human soul." "Being on the spiritual path is filled with hidden challenges and tests. Foster Perry reminds us that we can't do a spiritual bypass, but must confront the wounds that 'run us'." 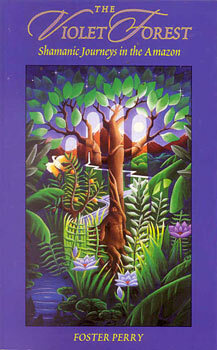 "Foster's insights and shamanic visions illuminate the path for any spiritual seeker." Foster Perry is a renowned spiritual healer who has taught experiential workshops and led medicine journeys to sacred sites in over twenty countries. He is the author of When Lightning Strikes a Hummingbird and the director of The Hummingbird Foundation in Santa Fe, New Mexico.